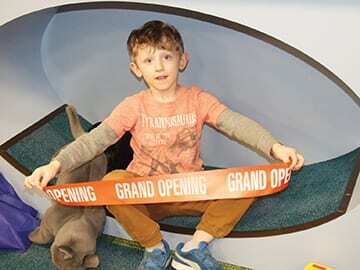 The Westland Area Library held a dedication ceremony on March 23 to celebrate the completion of the youth services department and teen area expansion. 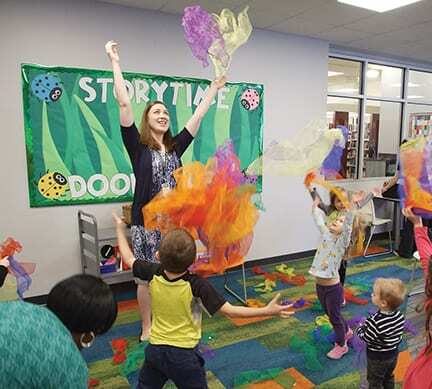 The project added more than 3,600 square feet of space that will be used to host interactive programs like the one youth services librarian Jessica Smith led during the ceremony. This reading nook was a popular destination for children like Isaac Linley, 5. Lauren Easley loves her local library. “We always come here,” said the Galloway resident. At least once a week, she and her 2-year-old son, Milo will go to the Westland Area Library in order to drop off the dozen or so books they had checked out and then scour the shelves for more. “We like to refresh our supply,” said Easley. But if there was one complaint she had about the library, it was its lack of a designated space for children. 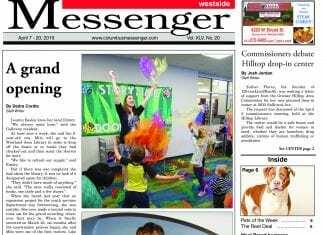 When she heard last year that an expansion project for the youth services department was forthcoming, she was ecstatic. She even made a mental note to come out for the grand unveiling, whenever that may be. When it finally occurred on March 23, six months after the construction process began, she and Milo were one of the first visitors. Like so many others who came out to the event, she was not at all prepared for what the finished product looked like. After rounding the corner near the main entrance, the patrons came across a piece of chalk art from youth services librarian Jessica Smith that depicts a scene from Frances Hodgson Burnett’s classic children’s novel, “The Secret Garden.” As both book and expansion project share a theme of exploration and discovery, a “cement path” woven into the carpet leads visitors to an archway filled with stuffed animals that welcome them to the sensory room. There, the space is filled with books, puzzles, reading nooks, multiple tables, computers and furniture. Upon leaving the sensory room, the path takes visitors to the youth services program area that will primarily be used to host public reading events and activities, such as the popular Storytime series that is held throughout the year. Adjacent but separate to the program area is a section for teens where they can browse books on the tree shelf, use specialized tables to access the Internet or just take a few moments to chill out. “It’s just a neat space for teens,” said Barnhart. Having worked at the library for nearly two decades, Barnhart has seen the growth of the patronage and been a witness to the need for the expansion of all departments, particularly for youth services. “It’s been pretty cramped for a long time,” she said. Barnhart said she was excited when the expansion project began, but didn’t realize just how much space would be added. Still, she knows it will be put to good use. Judging by the comments from the children and adults alike, they too plan to take advantage of the expansion.